There are claims that the Hollywood movies Lord of the Rings ("The Felloswhip of the Ring," "The Two Towers," "The Return of the King") used swords forged not in the fires of Mordor but in the fires of the northern town of Pozzorubio, Pangasinan. This claim is also made for the Braveheart (Mel Gibson) and Batman Begins (Christian Bale) using old jeepney leaf springs (called molye in Tagalog) and ordered by Hollywood movie producers. What's definite though is that the Hollywood movies of "The Lord of the Rings" trilogy were shot in New Zealand but the swords of Gandalf, the little Hobbit Frodo, the Dark Lord Sauron and "The Return of the King" Aragorn can be bought at swordsmiths shops (Panday or pandayan) scattered in this northern town of Pozorrubio, Pangasinan. How much do sword replicas cost in Pozzorubio? 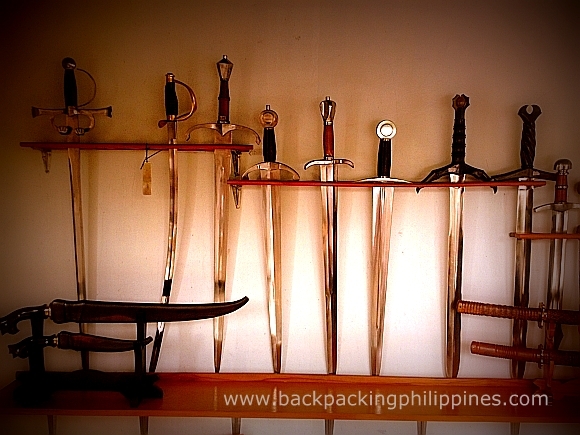 It's around PhP3,000.00 up, the longer the sword, more expensive it gets of course. Tutubi asked for the price of the Braveheart sword, 1.8 meters long and a few kilograms in weight that must give an idea how big and tall the real William Wallace was, the shopkeeper told him it's PhP8,000.000 while a Rambo jungle survival knife, a replica of Sylvester Stallone's knife in the popular Vietnam War movie is around PhP1,500.00. He asked for his business card and took note of the shops address, contact number and location coordinates in his GPS navigator so he can go back anytime without getting lost. Tutubi loves epic drama movies, or those set in the middle ages even prehistoric times (even if they mostly have historically fictitious scripts) and would love to buy replicas of swords used in those movies he loves: The Last Samurai (Tom Cruise), Kingdom of Heaven (Orlando Bloom), 300 (Gerard Butler), but money and space to actually display them swords are not yet in his arsenal. The claimed original sword of William Wallace, a Scotsman who rebelled against the king of England in the 13th century and whose life was made into the movie Braveheart, is 1.8 meters long and is stored at a museum in Scotland. 300 tells a fictionalized story about the Battle of Thermopylae where King Leonidas led 300 Spartan warriors to a battle against the Persian king Xerxes. The Battle of Thermopylae has a similar tale and ending as the Battle of Tirad Pass in Philippine history.